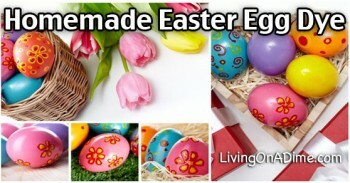 In this post, you’ll find great ideas and easy instructions for decorating Easter eggs including the traditional method, natural Easter egg dyes and other creative decorating suggestions. OK, so the kids noticed on the calendar that Easter is approaching and they want to make a huge production of decorating Easter eggs. In the past, the little stickers you bought at the store sufficed, but now they want the real thing. Here are some old standards for egg dying with a few new ideas for you. One important note: When the kids get really excited about egg dying, don’t feel sorry for them and pour the left over egg dye in their bath water so they can have more fun (no matter how much they beg and plead! Especially if it’s food coloring). Someone might panic and declare a citywide medical quarantine if they see your kids dyed all sorts of strange colors in their Easter finery. Before decorating Easter eggs, cover the entire table with newspaper. 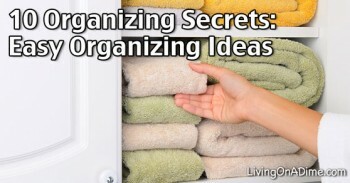 Keep a huge roll of paper towels or rags handy for messes. Have each kid wear one of dad’s old (now disposable) tee shirts. Cut toilet paper roll cores into one inch cylinders and use for egg stands. Decorate with stickers or paint. 2) Fill several mugs with boiling water and add 1-2 tsp. vinegar. 3) Place a few drops of desired food coloring in each mug. 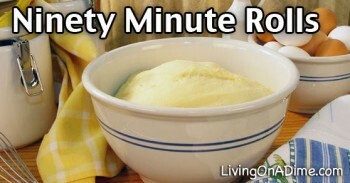 4) Place eggs in mugs for several minutes until eggs reach desired shades. 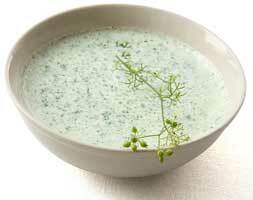 5) Remove with a spoon. Place on paper towel to dry. When dry, polish with a small amount of shortening on a paper towel. Buff until glossy. You can draw or write on the eggs with a light colored or white crayon before dipping. The drawing will remain white after the egg is dipped. To clean out mugs, put a little bleach water in the cups and soak for a few minutes. Hard boil eggs with 1 tsp. vinegar in the water. Place dying ingredients in non-aluminum pans, cover with water and boil 5 minutes to 1 hour until desired color is achieved. Use enough material to make at least 1 cup dye. Crush ingredients as they boil to extract as much dye as possible. Strain the dye. Most dyes should be used hot. Let each egg sit in the dye until it reaches the desired color. Some dyes will take longer than others to make the desired colored on the egg. Remove the egg and let dry. Glitter Eggs – Place 1 tablespoon each of glue and water in a cup. Stir the mixture and then paint the eggs with it. Sprinkle with glitter. 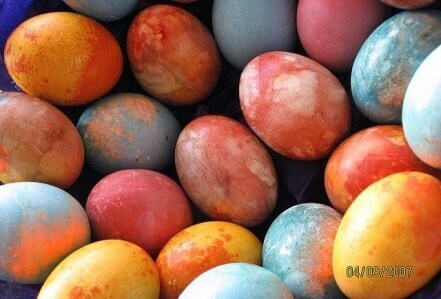 This can also add sparkle to already dyed eggs! Decoupaged Eggs – Tear small pieces of wrapping paper, napkins, stickers, or clip art. Mix equal amounts of glue and water. Paint egg with glue mixture. Place paper on top and then cover with more glue mixture. Let dry. Spotted Eggs – Place 1 tsp. of cooking oil in dye. Dip the egg. The oil will cause the dye to make an irregular pattern on the egg. Waxed Eggs – Dip a portion of the eggs in melted paraffin or candle wax. Then dip them in the dye. Remove from dye. Dry and peel off the wax. The egg will be white on one half and colored on the other half. You can also dip in dye before waxing to get two colors. Hollow Eggs – Poke a hole in one end of an egg with a very small needle. Poke another slightly larger hole in the other end. Then blow on the small end and the egg will come out the other side. Decorate Easter eggs as desired. I want to wish a Happy Easter, filled with blessings, to the Living on a Dime Family – Jill, Tawra & family, and the readers who visit here. Know that my wishes to those who celebrate something different, or not at all, carry the same good thoughts. Thank you Chris. Hope you have a wonderful Easter too. Make a small hole in each end of a raw egg and blow out the contents. Rinse well and let stand to dry for at least a day. Prepare Jello according to instructions on box. Pour liquid Jello into eggs, with a small funnel, sealing the eggs with a tiny piece of tape. Leave in refrigerator to set. Crack and peel! Kids love them! PLEASE – If you are going to use cores for easter egg stands, it is more sanitary to use paper towel cores rather than toilet paper cores. Most paper toweling is pulled from a stand or unrolled as needed while holding onto the roll, whereas many people could have inserted their hands/fingers INSIDE toilet paper cores to unwrap tissue, if it is not on a roller. Don’t expose little ones to germs unnecessarily. I don’t worry about this too much but some of you might. My kids and grandkids hands have been in much more unsanitary places then what is on the inside of a toilet paper roll. Just taking them into a public restroom and getting them out without touching anything is almost impossible so I don’t think too much on these things. Course there is always what happens at school and the things they touch there and then put in their hands in their mouth. The first time you find one digging around the cat box or chewing on a dog turd (excuse me for being indelicate) they found outside it pretty much is down hill from there no matter how I try or careful I try to be. I find that the child who does the most disgusting things, is the one who rarely gets sick and if she does, she has the lightest case. She even has a low white blood count! We try to be sanitary and wash up, but we DON’T do the hand sanitizer! They need to build an immune system, rather than protect it. So, yes Jill, I agree with you! To create stripes on your eggs, dip the egg only partway. You can immerse the egg totally in one color, then when dry, dip it partway into another to make another section of color. For example, immerse egg totally in yellow. When colored and dry, immerse it partway into blue. That end will be green, the other end will be yellow. Now immerse the yellow end into red, making one end orange, the middle yellow, and the other end green. You can use the resist crayon technique to create other designs in white, or yellow overall. Unfortunately, there is no one to dye eggs with at my house any longer but I did love doing this. I can remember one year the power went out and we dyed the eggs by a kerosene lantern. My family still talks about that. I cooked some red and green cabbage together this weekend and after it sat in the fridge overnight, the juices were a beautiful purple. I wonder if you could dye eyes with this liquid because it cettainly left a small stain on my countertop. I was able to get it off with vinegar but the color was a lucious purple. Worth a try. A Happy and Joyous Easter to one and all and especially to Jill and Tawra and Mike and their family. We thank you for this terrific website. Dear Maggie, Go ahead and dye some eggs! Have fun with it and if you get tired of egg salad sandwiches and angel eggs (Instead of ‘deviled’ eggs 🙂 Give them to a friend, or the dogs or the compost heap… Give yourself permission to have fun and enjoy this activity! Hard boil eggs and let cool AT ROOM TEMP. Chilled eggs won’t take die! Use the VINEGAR to wet the paper towel til pretty wet—not sopping. 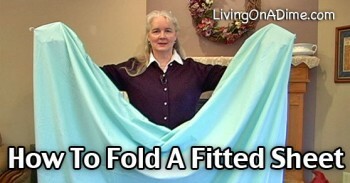 Crumple up paper towel and drop undiluted food colour onto the paper towel at intervals so they will over lap. Wrap paper towel around egg so that colour touches shell. Over wrap with alum foil or plastic—if using plastic you might want a few rubber bands to hold it or hold in hands for a minute. Rubber band Decorating: Use different sized rubber bands to wrap the eggs with either undyed or with a light color and then dip into a darker shade. Let dry and remove. There is a technigue to make gorgeous Marbelized Eggs (think the end papers of old books!) I think it involves floating some oil on top of the water and then putting some dye or paint on, swirl the colours around and then carefully dip THRU the colour and oil—sure you could find this in the Net somewheres! Also raid your craft scraps bin for lace, rick rack, beads, pearls, fabric etc. I have cute little “dolls” made from blown eggs that are 40+ years old decorated this way! You can also carefully drip wax on eggs , dye, peel, and re-drip and re dye. I think I’m going to try to imprint a cross on my eggs using the rubber band idea. Cool! If you crack the shells before dying the eggs, the egg whites get dyed too. It comes out looking marbled & the kids love it. Kim, That idea sounds nice!